The newest in South African book services, the book butterfly allows for hands free reading. Oftentimes, a product will arrive on the market which in theory sounds great, but in practise, leaves rather much to be desired. I was emailed a rather amusing letter from the creator of the Bookbutterfly, asking if I would like to try one out. 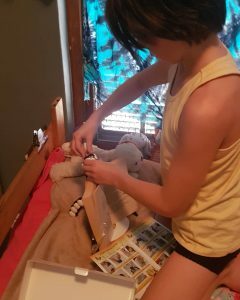 I am all for trying new things, especially if it has anything to do with books, and considering that my 10 (almost 11) year old daughter Loves all gadget type products, I knew that even if it didn’t work for me, she would love it. So, I said yes, send me one, let us give it a go. Well, what a hit. From the moment it arrived (in the school holidays so my daughter was here when the parcel arrived), until now, it has been extremely well used. She loves it. 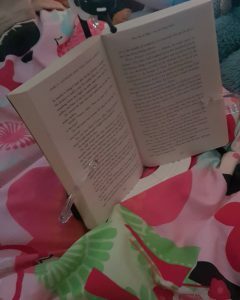 At bedtime, she supports her book in the holder, rests it on her pillow at just the right angle to allow a side lying position, at lunchtime, she has her book in front of her and hands free for eating. 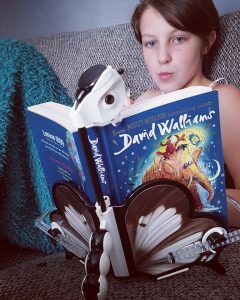 She loved setting it up, and the fact that it comes with a little light to assist in night time reading was just the best. I have managed to pry it away from her bedside, once her lights are out, quietly sneaking into her room to take it and use if for my own bed time reading. It is fabulous if you have weak wrists and holding heavy books is not an option. 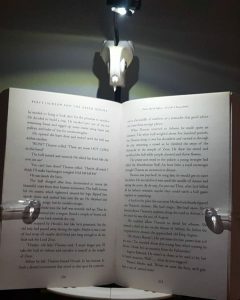 It has been cleverly designed to allow ease of turning pages, clear little wings which hold the book open but do not interfere with the printed word and, if you choose the book light option, you have an extendable lamp to read by in the dark. 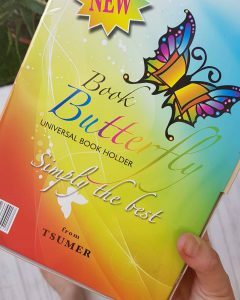 I thought the cutest thing was that the Book Butterfly is designed to look like a butterfly, and I do believe you even have the option of choosing your own wing colours. A proudly South African product, you can contact Trevor sales@bookbutterfly.net or you can find your own here.